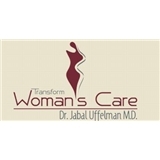 Transform Woman's Care (Fort Lauderdale) - Book Appointment Online! We are a Women’s Health Care practice and specialize in leading-edge medicine with the perspective and confidence of decades of experience in a state-of-the-art and visually pleasing environment. Dr. Jabal Uffelman, M.D. is a seasoned and highly capable gynecologist conveniently located in Fort Lauderdale, Florida. Dr. Uffelman is well-trained, has exceptional credentials and possesses several years of caring for women. This is only part of why he provides some of South Florida's best Women’s Healthcare. During his time of caring for women of all ages, Dr. Uffelman has always led with his heart. He has committed himself to the unique, individual needs of women, because he truly cares about them. Professional , kind, state of the art equipment and knowledge. Nice welcome and I felt completely safe.